Marble features are a tremendous trend these days, we use it on the floor, has a wallpaper for our rooms and even as a design for a phone case. Designers always have to keep up with the trends so here are some fabulous contemporary lighting designs to stylish up your home! A true icon for a modern marble lighting is the Arco LED Floor Lamp, although it looks like a simple piece, the combination of marble and metal gives this lamp a modern and classic style. The base is made of marble and the metal designs just make it a definite go to, to decor our home! This next piece, Is called CALLA and it would suit perfectly any table. This lamp combines the contemporary and modern style that applauds the use of marble and mixes this feature with a leave made of aged brass, it is a touch of the natural environment. Because we all have different styles, here is an opportunity to combine the now- a- days trends with a more natural style. For the simplistic and minimalistic type of style, this kind of suspension lamp would fit perfectly in any room. If you are looking for a more outrageous and sophisticated lighting design this next table lamp will be great for you. In a simple black tone, it features a golden crocodile in its marble base, this lamp has its own personal designed style. Getting back to the white marble type of lamps, this next suspension lamp is indeed similar to one referred before. However, this one has a particular feature, it allows the light to shine through the marble, giving it a unique style. 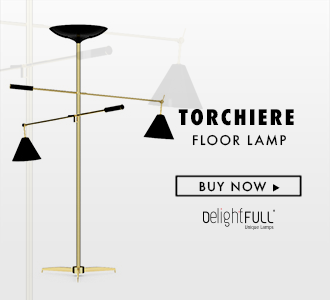 This piece is a floor lamp that can be customized in terms of color, the upper part is made of brass while the down part is made with marble, it is a fantastic piece since it enables the room to have a lot of light. This piece is also available as a suspension lamp! You can completely understand the background music in this design, it is a style and trendy lamp that will call the attention of anyone who enters the room, it is definitely a “must have”. Here we can take a look at various lamp styles! However I call your attention to the piece standing at the left of the balcony, it is a gorgeous golden and marble lamp that recalls for the attention of potentially sophisticated owners. It is indeed a refined piece that will make anyone stand staring! SEE ALSO: 2016 DINING ROOM LIGHTING IDEAS So? What will be your choice? We hope you liked today´s article. Feel free to pin all the images to your favorite Pinterest board or to print it and use in your mood board. Don’t forget to explore our Pinterest for more Contemporary Lighting Ideas. You can also take a look at our Instagram profile for frequent updates with inspiring content!